What are CIS professional certifications, and what can they do for you? In a world fraught with personal and corporate financial insecurity, the need for skilled and knowledgeable business professionals has never been greater. Compliance with local and international laws and industry regulations have raised the bar for professional business practices expected of organizations, which have in turn increased the need for professionals who know how to help organizations fulfill and document compliance with the new laws and regulations. Establishing and maintaining a solid risk-based approach to managing information security, business continuity/disaster recovery, and fraud control is no longer simply a good thing for organizations to do. Today, regulators demand it. Your experience in the field is an important component of your value to an employer. But experience isn’t enough. Employers need something quantifiable and verifiable to show them you have the expertise they need. Certification by a respected accreditation organization is becoming indispensable to the business professional. Establish and manage effective enterprise risk management programs in conformance with internationally accepted frameworks and best practices. Control internal fraud and abuse. Secure information according to international best practices and stakeholder expectations. Plan, deploy, maintain, and improve business continuity and disaster recovery management according to international best practices to ensure that critical business processes can survive disruptive events, and are restored within recovery time objectives. With the proper training and certification by Certified Information Security, you can illustrate to employers your documented and proven expertise to fulfil new and urgent needs in each of these three critical areas. Certified Information Security is an Authorized Training and Education Center (ATEC) for the International Risk Management Certification Board (IRMCB). CIS certifications are NOT certified and accredited to ISO standard 17024. Being a member of CIS says a lot about who you are, which is, after all, a consummate professional in a world fraught with security threats, including fraud incidents and other business disruptions. Certification gives you the backing, the education, the colleagues, the networking system, and the power to face these threats head on. With CIS certification, you’ll be part of a globally recognized family of information professionals. You’ll have access to our full spectrum of global resources, inside informational activities, private forums and peer networking, mentoring and sponsoring, research and teaching, and a wealth of ongoing information security, fraud control, and business continuity management opportunities at your fingertips. 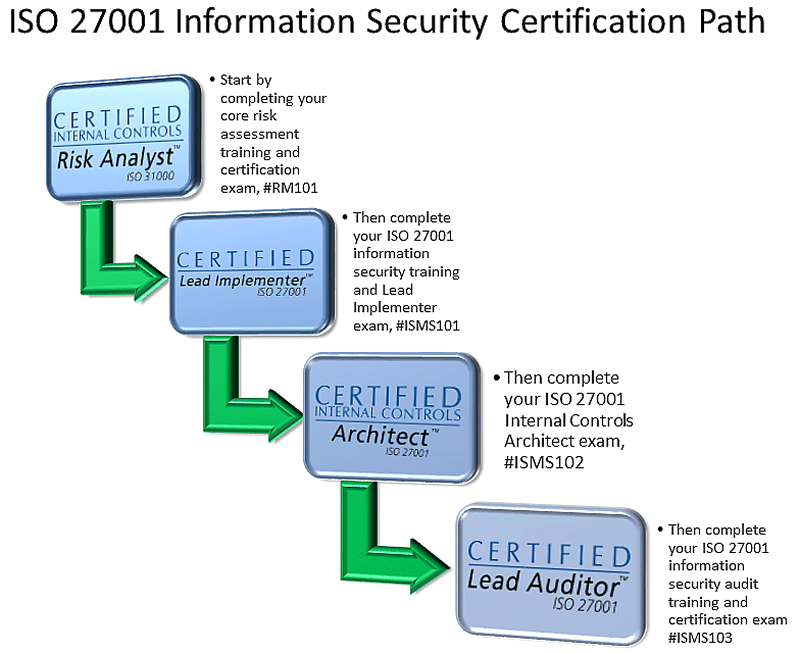 Because all information security analysis, controls, and processes are essentially a product of risk management, ISO/IEC 31000 and 27005 provides the framework for how to apply proper risk management within the ISO/IEC 27001/27002 ISMS, or within the 22301 BCMS. The CICRA credential by IRMCB certifies your understanding of how ISO/IEC 31000, 31010, and 27005 can be used to develop a custom enterprise risk management program that fulfills the requirements of both ISO/IEC 27001, and ISO 22301. It also helps fulfil the competence requirements of the certifications themselves. Certified Information Security provides the training and credentialing you need to become recognized as an authority in leading or facilitating risk assessment and management according to the ISO/IEC 31000, 31010, and 27005 standards. 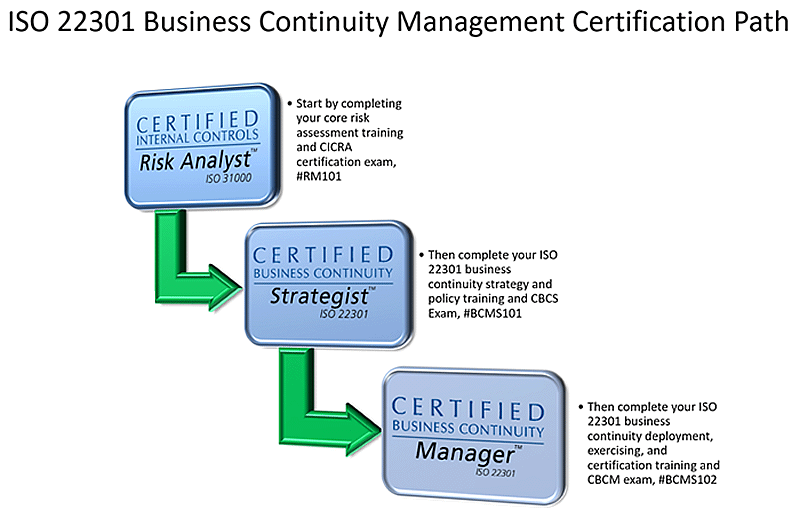 ISO 31000 CICRA is the risk management certification supporting a career in risk management, information security management, or business continuity/disaster recovery management. It is appropriate for all members of the BCMS or ISMS committee. This certification validates competence and understanding for developing and managing a custom risk-management methodology based upon the ISO/IEC 31000/27005 Risk Management Frameworks. Building upon the foundation understanding of the ISO 27005 risk management framework validated by the Certified Internal Controls Risk Analyst credential, the Certified ISO 27001 Lead Implementer certification certifies your ability to deploy and manage an ISO 27001 conforming Information Security Management System (ISMS). Building upon the foundation understanding of the ISO 27005 risk management framework validated by the Certified Internal Controls Risk Analyst and Certified ISO 27001 Lead Implementer credentials, the Certified SO 27001 Internal Controls Architect (CICA) certification certifies your ability to develop the formal structure, governance, and policy of an ISO 27001 conforming Information Security Management System (ISMS). Furthermore, the CICA certification ensures that you are qualified to develop strategic objectives according to core ISO 27001, 27002, 27003, and 27005 best practices. Building upon the foundation understanding of the ISO 31000 and 27005 risk management frameworks, and the ISO 27001 framework validated by the Certified Internal Controls Architect credential, the ISO 27001 Lead Auditor certification further certifies your ability to audit the formal structure, governance, and policy of an ISO 27001 conforming Information Security Management System (ISMS). Furthermore, the ISO 27001 Lead Auditor certification ensures that you are qualified to assure strategic objectives according to core ISO 27001, 27002, 27003, and 27005 best practices. This professional certification is applicable to those needing to conduct internal or external audits of a risk management system supporting an ISMS, or how to manage an ISO 27001 ISMS audit program. This is the only ISO 27001 Lead Auditor training and professional examination program to incorporate ISO's 27007 standard as core content within its program. ISO 37001 CABCM™ is the anti-bribery management certification appropriate for managers at every level, including top management at the officer and vice president level. This certification validates competence and understanding for developing and managing a custom anti-bribery and anti-corruption system and methodology based upon the ISO 37001 Anti-Bribery Management System framework. If you’re a procurement manager or practitioner, you already know the critical role of procurement plays in controlling fraud and abuse as it relates to protecting an organization’s investment in acquiring goods and services. Achieving CPFCS certification shows that you are a uniquely qualified procurement professional with the mission-critical know-how and skills to prevent, detect, and even investigate/recover expensive fraud loss due to fraudulent billing schemes, expense reimbursement fraud, tender and contract fraud, bid rigging, corruption, collusion, disbursement (payment) fraud, and other procurement and acquisition-related schemes. This is the entry-level fraud control certification for fraud control professionals with less than two years of qualified experience. If you’re a student or career changer considering moving into fraud control management, you are eligible to become certified as a Fraud Control Associate by Certified Information Security. By aligning yourself with an industry leader in fraud control education, you’re jumping ahead of thousands of others vying for solid positions in the early stages of their careers. Fraud Control is an immensely rewarding career with unlimited possibilities. Earning your CFCA™ is an excellent way to get off to a good start! This is the mid-level fraud control certification for fraud control professionals with at least two years of qualified experience. You have already been involved with controlling fraud in your career for at least two years as an accountant, human resource professional, auditor, security professional, or manager, but are now ready to base your career in fraud control. Your experience in the field is an important component of your value to an employer. But experience just isn’t enough. Employers need something quantifiable and verifiable to show them you have the expertise they need. Earning the CFCP™ certification will give you the credential and proof of expertise today's employers require. This is the expert-level fraud control certification for fraud control professionals with at least five years of qualified experience. One of your primary responsibilities is protecting the organization from suffering losses and business disruption resulting from internal occupational fraud and abuse. Your experience in the field is an important component of your value to an employer. As a designated leader of fraud prevention, detection, and investigation processes, your employer counts on you to mitigate fraud risk throughout the enterprise. You have at least five years fraud control related experience, but experience just isn’t enough. Employers need something quantifiable and verifiable to show them you have the expertise they need, and you want to establish occupational identity with a respected certification in internal fraud risk prevention and mitigation. Earning the CFCM™ certification will give you the credential and proof of expertise today's employers require. Prepare for your CISSP certification exam! Get the same CISA training over 8,200 candidates across the world have used to prepare for this rigorous ISACA exam since 2006. With this web-based CISA training, you will have 24x7 access to the most recognized and qualified exam preparation in the world. Personally prepared, constantly updated, and presented by #1 best-selling ISACA exam prep author Allen Keele, this course provides everything you need to be able to pass your certification exam. Get the same CISM training over 4,000 CISM candidates across the world have used to prepare for the rigorous CISM exam since 2007. With this web-based CISM training, you will have 24x7 access to the most recognized and qualified exam preparation in the world. Personally prepared, constantly updated, and presented by #1 best-selling ISACA exam prep author Allen Keele, this course provides everything you need to be able to pass the CISM exam. Since 2006, CIS training has earned a world-wide reputation for providing everything you need to know for ISACA's certification exams, and delivering the passing score you strive for. Our CRISC training is completely up-to-date addressing the latest ISACA exam objectives and job practice areas. Now with over 590 unique training practice questions especially designed for ISACA's CRISC exam! You will learn everything you need to know with the knowledge gained from over 360 narrated screens, and over 590 practice questions.